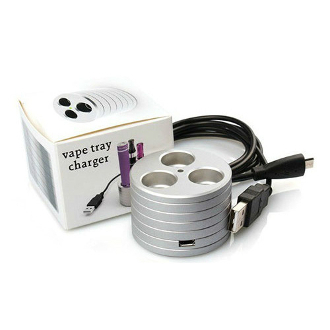 The Vape Tray Charger is a unique charging system that pairs a charger with a holding tray. You’ll never have your battery or clearomizer roll off the table again while you’re charging batteries or changing/adding liquid to your clearomizers. It comes is a myriad of different colors; silver, black and red are available at the moment but check back because more colors are on their way. Because of its versatile color choices and how easy this tray makes charging and refilling your e-cigarette, it is a perfect addition to your home and/or office. It will also fit well in a cup holder in your car and will charge using a USB car charger. The Vape Tray Charger is made of aluminum and has 3 wells cut into it. Two of the wells are meant for extra batteries or clearomizers to stand up in while you charge or fill. The other well is fitted with a 510 threaded charger for eGo batteries. TO USE: Simply place the battery in the charging well upside down and screw it clockwise onto the charger. The LED light on the top of the Vape Tray will light up RED while the battery is charging and will turn GREEN when the battery is finished charging. When the battery is done charging, turn counterclockwise and remove from the charger port. Do not leave a charged battery on the charger. This can damage the battery and void the warrantee. NOTE: The Vape Tray comes with a micro USB cord. This cord can be plugged into any USB port or wall charger with USB port but this charging cord should be the only one used with this vape tray.